International real estate developer, Tishman Speyer, celebrates the re-opening of the former Economist Plaza with the launch of a new public sculpture installation by Swiss artist, Olaf Breuning, in collaboration with CASS Sculpture Foundation and Metro Pictures, New York and curated by Encounter Contemporary. The iconic plaza, which will upon opening be renamed as ‘The Smithson Plaza’, has a long history of showcasing public artworks of leading established and emerging artists, including Sir Eduardo Paolozzi. The exhibition will mark the completion of the first phase of renovations at 23-27 St James’s Street and the relaunch of a dynamic contemporary arts programme, which was originally established in 1964. Breuning has been selected as the first artist to be showcased in the public arts programme with a selection of five life-size sculptures with audacious and eye-catching messages, set to be unveiled to the public on 7th June. Breuning, who has previously exhibited in venues from Palais de Tokyo to MOMA, is acclaimed for his diverse and bold works, manifesting his messages through multifarious medias. Known as an experimentalist, his work intelligently explores pertinent aspects of contemporary society, incorporating language and absurdist humour to speak directly to its audiences. Each stainless steel sculpture stands at approximately six feet tall with cut-outs of mirrored cartoonish heads mounted on scaffold supports and filled with a thought or speech bubble. The contents of each bubble range from text stating ‘Much Too Much Just Too Much’ to instantly recognisable symbols such as the thumbs-up or a heart. Reflective comments on the conditions of daily contemporary life are conveyed through bold, yet simple forms in a similar style to graphic novels. Breuning repurposes and playfully adopts the iconography and experience of popular culture by capturing and reflecting on a generation that is obsessed with the internet. The ‘heads’ will take up home in the plaza as a comment on society’s fast-paced, overwhelming and media-driven contemporary existence. The hope is the installation will encourage passerbys to take a few minutes away from their busy schedules and our hyper-connected, technological world and enjoy a few moments of reflection. Olaf Breuning comments: "The heads reflect their surrounding and speak in a simplified emoji language. Our time seems to be ever more complicated, with a lot more information reflecting on us. This makes it understandable that we, simply just do not have the time to make detailed and thoughtful statements in such a fast moving world. “i like” or “i dont like” it's just enough for the moment. However, having said that, “i like” that the heads will be shown in London!" A major exhibition of Breuning’s works is currently at the CASS Sculpture Foundation in Chichester until 2 September 2018, and features Clouds, six monumental cartoonish steel sculptures in hues of bright blue installed within the sculpture park, and Scrap Faces, surreal faces made from salvaged wood sourced from West Sussex, in the main gallery. 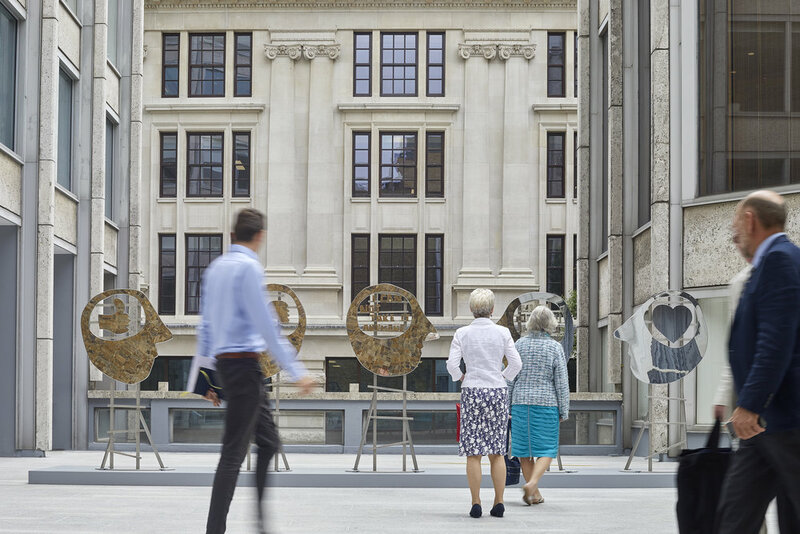 The Smithson Plaza will re-open on 7th June and architects Alison and Peter Smithson’s original intent for the plaza as a public social space will be restored, also reinstating a centre-stage for public exhibitions in the capital. To find out more information about The Smithson Plaza, please visit https://smithson-plaza.com/ and for more information about Tishman Speyer, please visit http://www.tishmanspeyer.com/. Under Tishman Speyer’s stewardship, the estate is undergoing a substantial refurbishment. The first phase renovation works, which will complete in spring 2018, consists of upgrading the buildings and the plaza to deliver a renewed destination and prime office space for St James’s while reconnecting with the Smithsons’ original design. A new lobby and a 1,500 sq ft café will welcome occupiers and visitors to the Smithson Tower at plaza level. Six newly renovated upper floors, totalling approximately 22,000 sq. ft will be delivered as part of the first phase. At street level, the scheme will create a new 4,600 sq ft retail space with access to Bury Street and Ryder Street. Olaf Breuning was born in 1970 in Schaffhausen, Switzerland, and currently lives and works in New York. He was the subject of a major retrospective at the NRW-Forum Düsseldorf in 2016. Additionally, he has had solo exhibitions at Palais de Tokyo, Paris; Chisenhale Gallery, London; Kunstverein Freiburg, Germany; Kunsthall Stavanger, Norway; and the Paul Klee Museum, Bern. He participated in the 2008 Whitney Biennial and has been featured in group exhibitions at the Museum of Modern Art, New York; Pompidou Centre, Paris; Haus der Kunst, Munich; Kunsthalle Zurich; Walker Art Centre, Minneapolis; Jeu de Paume, Paris; KW Institute for Contemporary Art, Berlin; Whitechapel Gallery, London; and the Mori Art Museum, Tokyo. Cass Sculpture Foundation is a British charity founded 25 years ago with a clear mission to provide both established and emerging artists with unique creative opportunities. The organisation has since commissioned and exhibited over 450 works. CASS works with artists throughout every step of the commissioning process, providing expertise and professional development. The CASS grounds consist of 26 acres of beautiful woodland within the Goodwood Estate, West Sussex. The site is open to the public, and has a constantly changing display of approximately 60 monumental outdoor sculptures. Proceeds from sculpture sales are divided evenly between the artist and the Foundation’s fund for future commissions. CASS also raises income to support its charitable mission, through ticket sales, philanthropy and consultancy services. Encounter Contemporary has been appointed by Tishman Speyer to curate and manage The Smithson Plaza’s art program. Founded in 2013 by Alexander Caspari and Jordan Harris, Encounter Contemporary is a curatorial platform, dealership and contemporary art consultancy. The company focuses on promoting a diverse and innovative group of established and emerging contemporary artists who are transforming the way art is made and presented. We run an international ‘moving’ exhibition program curating academically rigorous, ambitious and immersive shows. Working closely with both long standing and new clients on an ongoing basis we confidently source only the best artworks from our trusted international network of artists, art professionals and private collections.